My kids love foods with Mexican flavors. 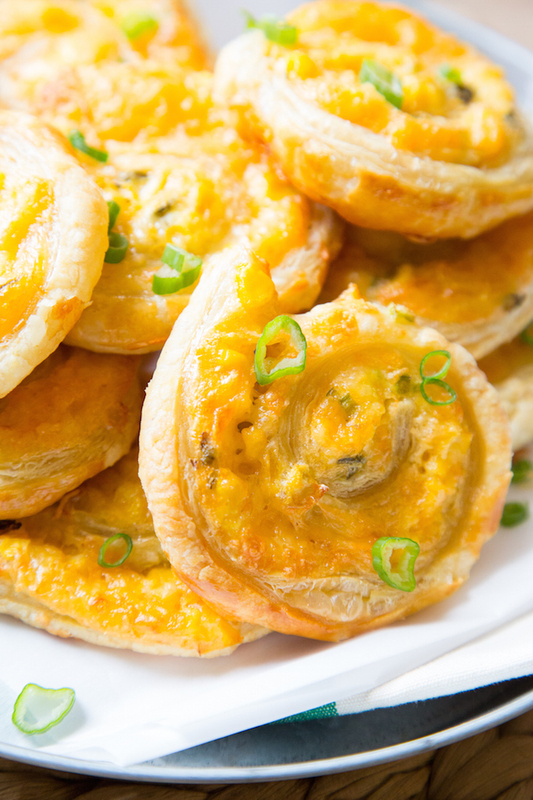 A current favorite: Fiesta pinwheels. And who can blame them? 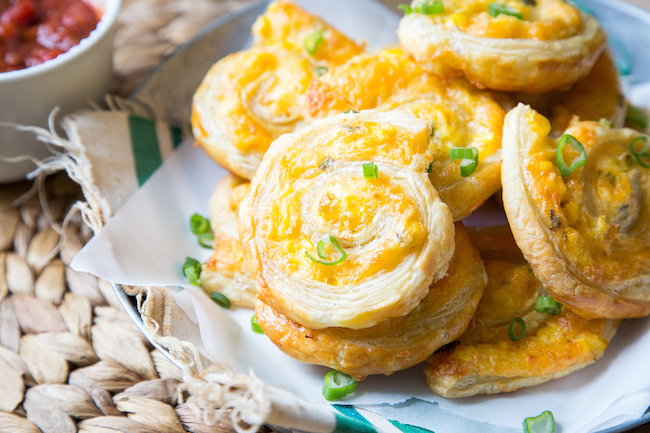 Buttery puff pastry and a zesty cheese filling make this simple snack so irresistible. The pinwheels bake up crispy on the outside and gooey on the inside. Delicioso! And here’s the thing: My fiesta pinwheels recipe freezes well, so leftovers (if there are any!) never go to waste. I can pop a few in the oven whenever my kids (or I) need a snack. I’ll serve guacamole (for them) and salsa cruda (for me) on the side. My kids love this easy make-ahead snack. Hopefully yours will, too. It's delicioso! Step 1: Preheat oven to 400 degrees F. Allow the puff pastry to thaw (follow package instructions). In a bowl combine the drained corn kernels, shredded cheese, optional sliced scallions, and taco seasoning. Step 2: Roll out the sheet of the thawed puff pastry and brush the egg wash over the entire sheet. The evenly sprinkle the corn-cheese mixture over the top. (Be sure to leave a 1 inch border alongside one of the edges.) Carefully roll the puff pastry sheet into a tight log, brush the edge with egg wash, and press to seal. Place the log on a parchment-lined baking sheet (seam-side down) and freeze for 10 minutes. Step 4: Gently place each slice back onto the baking sheet. Leave about 1½ inches between each pinwheel. Brush the tops of the pinwheels with the remaining egg wash, and bake for about 15 minutes or until deeply golden and crispy. If baking from frozen, add an additional 15 minutes to the cooking time and watch the pinwheels closely to avoid burning.